A thrilling collection of Viking myths, brought to life with evocative illustrations. Meet dragon-slaying heroes and giant-smashing gods, as well as Thor, the thunder god, Loki the shape-shifting trickster and sea serpents, fire demons and frost giants in these awe-inspiring myths. Includes a guide to Norse names and characters, and internet links to websites to find out more about the Vikings. I really like the book because it has helped explain how different characters are linked and the Myths are written in such a way that my 2 kids are totally fine reading them by themselves (well some of the names are really hard to pronounce but we don’t stress over that). 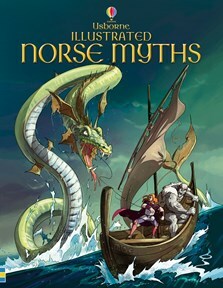 Visit Usborne Quicklinks for an A to Z pronunciation guide to the names in the "Usborne Illustrated Norse Myths".